I picked up the first season of Stranger Things on Blu-ray from Target last Black Friday. I had only started watching the show on Netflix a few months early and fell instantly in love with the series. When the second season was released on Netflix I binged it within a few days. It seemed like the second season wouldn't make its way to Blu-ray, let alone in the same kind of cool retro VHS case the first season was released. 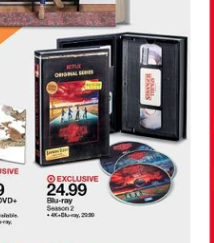 While flipping through the Target ad this week I noticed the second season is included for release later this week. If you're like me, this was exciting news. Took my Dad to First Ave.
2018 - RJW3. Awesome Inc. theme. Powered by Blogger.